Do you gravitate back to the same place for your annual summer holidays? 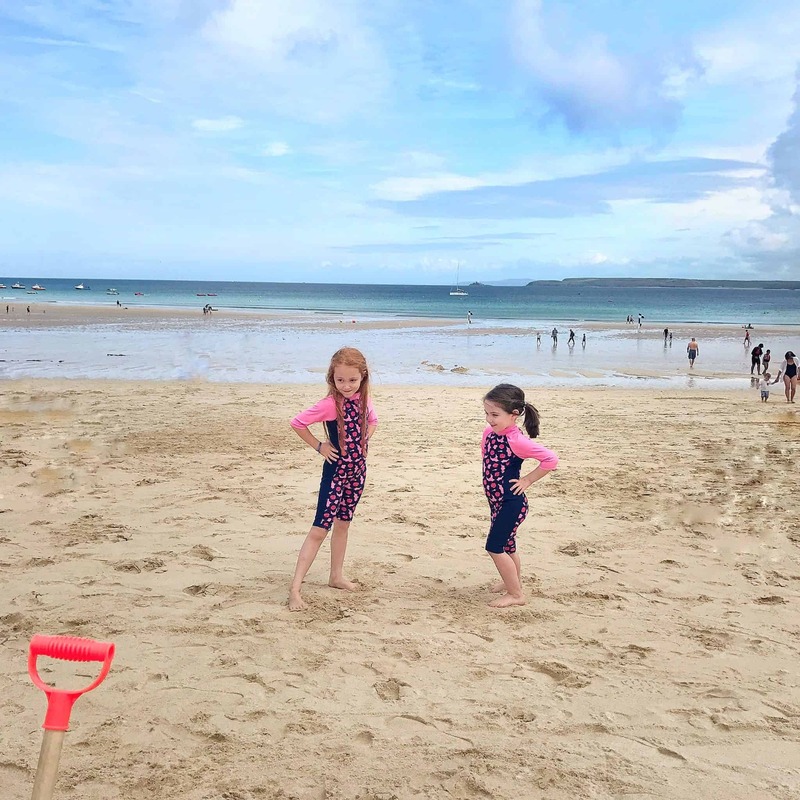 We’ve been back to St Ives virtually every summer for the past six years, or possibly even longer. It has everything we want from a holiday, even some sunshine (apart from one very rainy year). As you can imagine, we have lots of very happy memories of Cornwall. 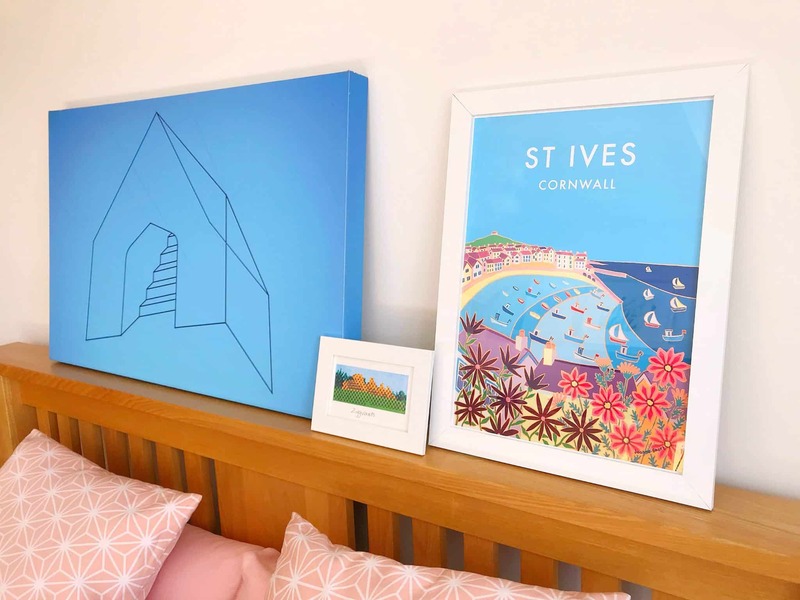 When we’re down in St Ives, we often browse the little galleries and dream about owning a piece of Cornish art. 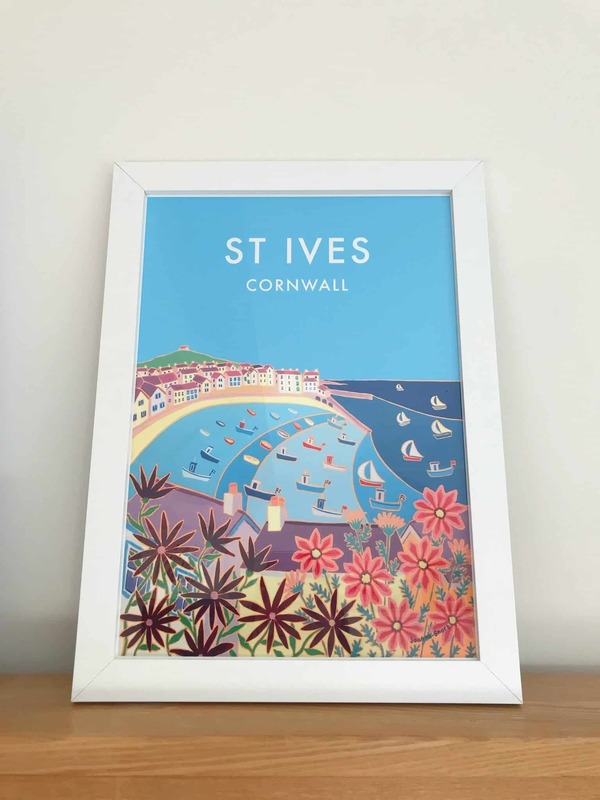 Well, thanks to The John Dyer Gallery, we are now the proud owners of a wonderful vintage-style art poster of St Ives, by Joanne Short. I chose this beautiful view of St Ives by Joanne Short, as it is delightfully colourful, sunny and cheerful. The colours pop off the picture, and evoke such happy memories of Cornwall. The golden sands, the blue sea and sky and the pretty houses are just perfect. The colourful flowers in the foreground are so beautiful, they just make us smile. 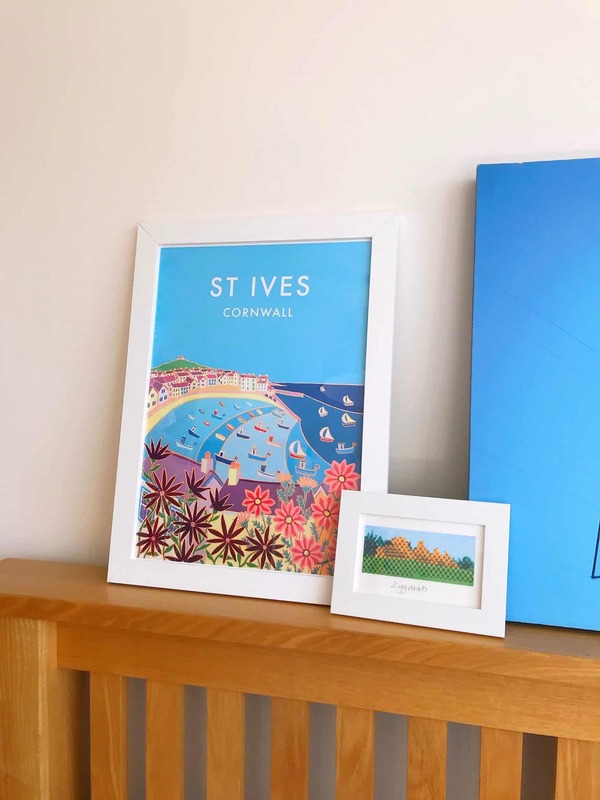 Our St Ives print comes in A2 and A3 size, in framed and unframed, and we were gifted the A3 framed version, which is £45. 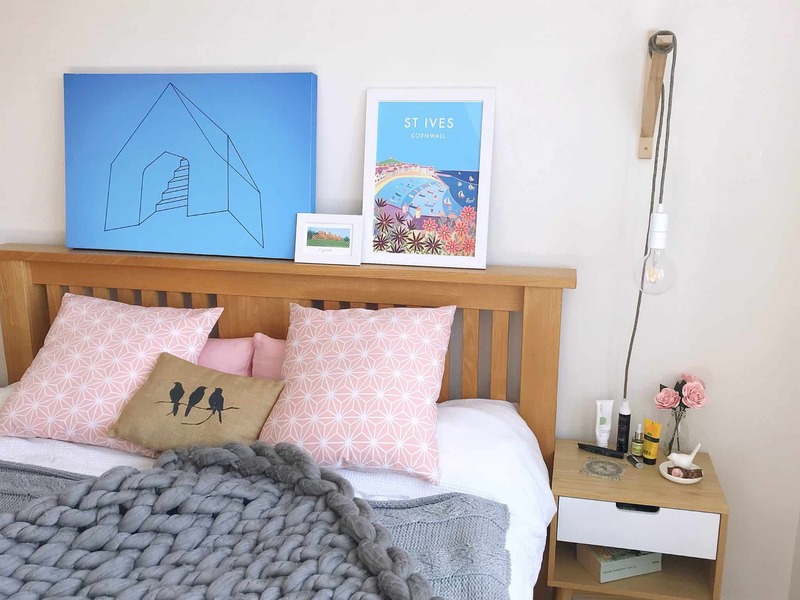 I’ve placed it above our bed, next to the canvas print of an art installation we loved in New Zealand, and a little print of my university halls of residence. Three very special places, tied together by stunning blue skies. We’ve spend may happy hours making sandcastles on this beach. We’ve eaten pasties and ice creams (whilst fighting off the seagulls!) and eaten cream teas in the cafes overlooking the sea. 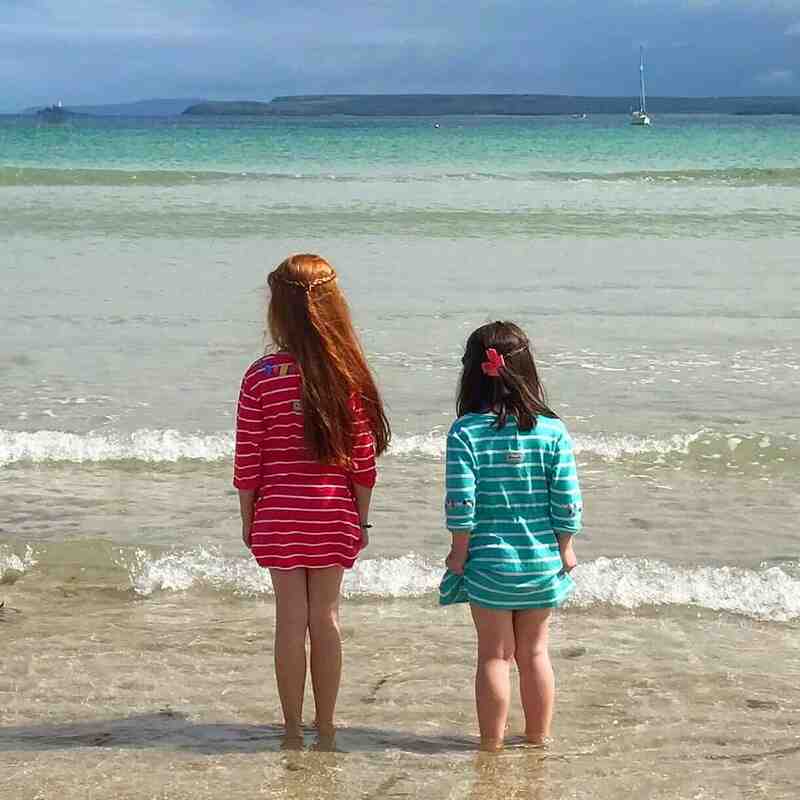 I dug out a few photos of our last holiday to St Ives: this is the same beach as in the artwork, from the other side. 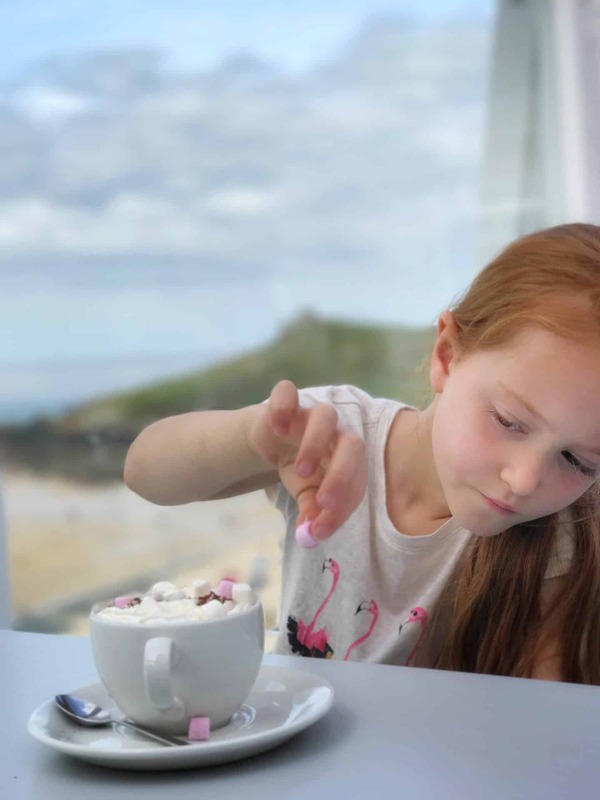 We climbed up the hill, and you can see it here in background of this picture of Ava and her hot chocolate at the Tate St Ives. I have a feeling this could be the start of a collection. 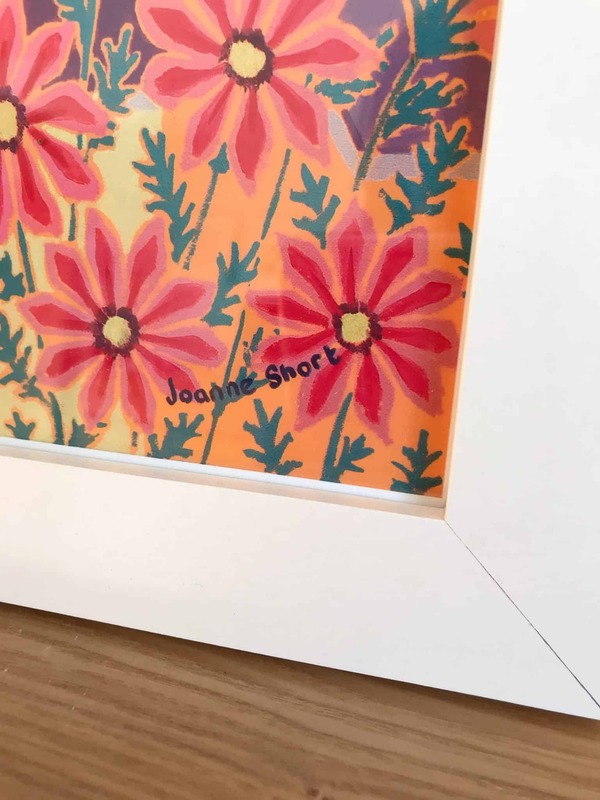 There are lots of other prints to choose from, all equally beautiful. They would look fantastic as a triptych, don’t you think? 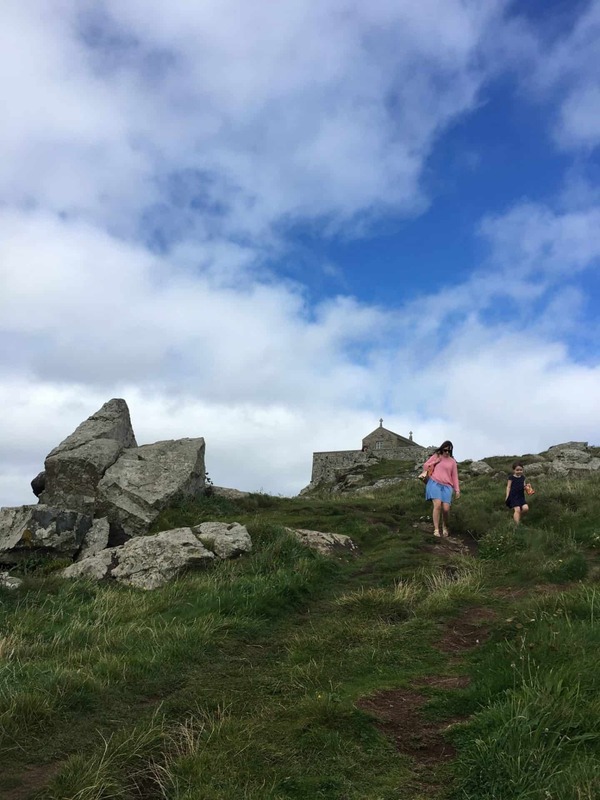 Do you have any happy memories of Cornwall, or perhaps another British holiday? What a lovely souvenir of all your precious holiday memories. 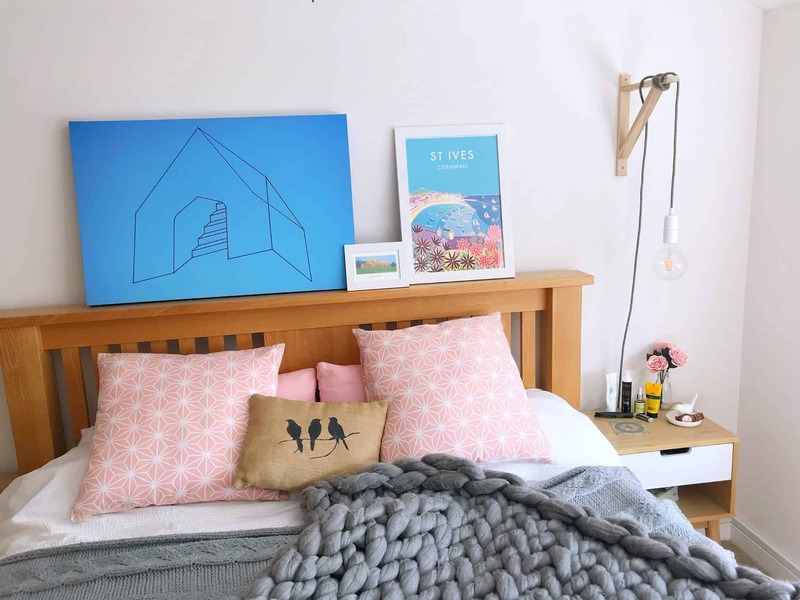 Looks great in your bedroom with your other art work. 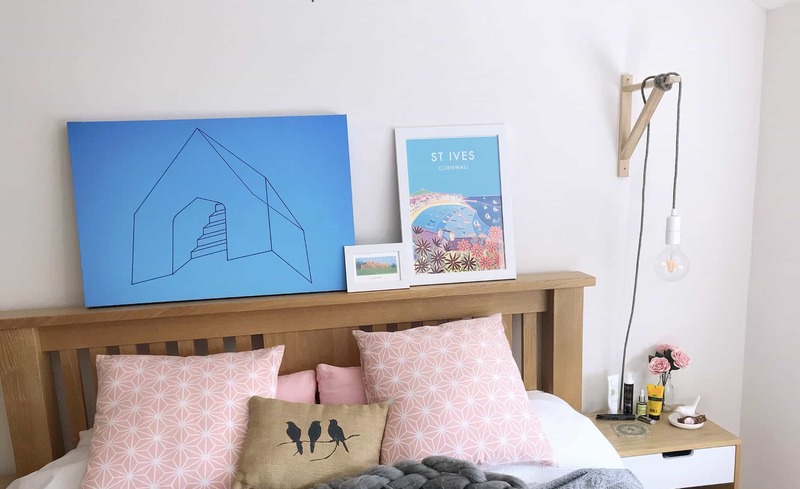 I’ve not been to St. Ives but I would like to go. The painting is lovely. I love this. 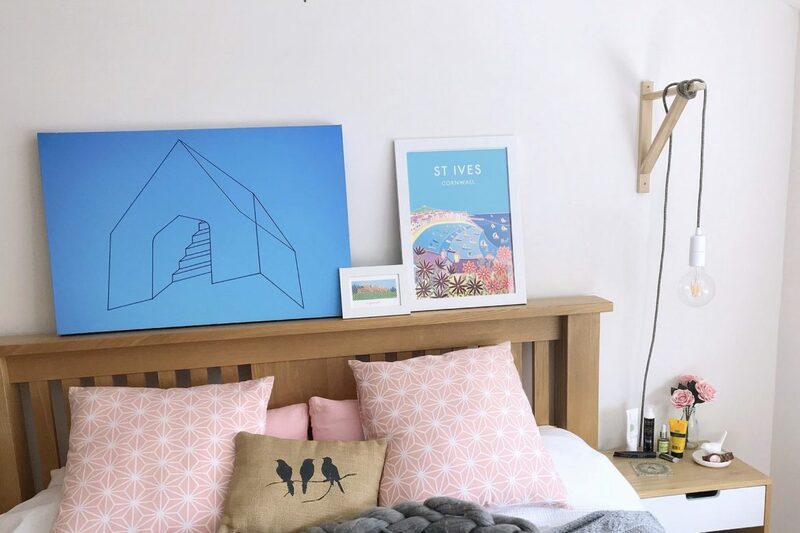 We’ve been to Cornwall a couple of times and we bought a painting on our second visit. The Artist has a gallery in St.Ives on St. Andrews Street which I think might now have closed, it was called Colin Evans Gallery. Every time I look at the picture it reminds me what a lovely time we had. These are so lovely. We went to Cornwall many years ago, when the Eden project first opened, and loved it! So envious of your annual visits to Cornwall. Such a lovely part of the world. 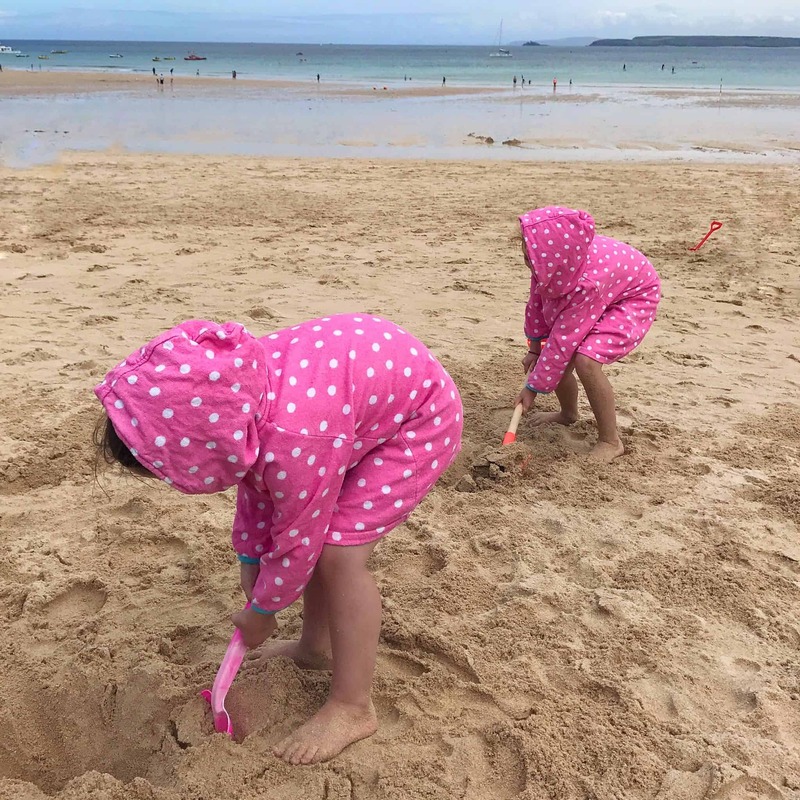 The quintessential English seaside holiday! Love how Joanne Short has captured it’s true essence too! Thanks Tom, she really has captured it hasn’t she? Love it! What a cute print! I’ve never been to Cornwall but I’s love to go some time this year. They say it’s very similar to northen Spain where I come from. I really recommend it, there’s so much to do and beautiful gardens and beaches. We always discover new gems!